1945 was one of the most traumatic years in world history, particularly in Latvia. The Soviet occupation, which had already begun in 1944, added to the misery of many years of war which left Latvia and many other nations devastated. Much of Latvia, Rīga in particular, was in ruins, with rubble remaining where many buildings once stood. Many composers have found inspiration for their composition from the years of war, and two Latvian composers have created works influenced specifically by the year 1945. The first was the renowned 20th century symphonist Jānis Ivanovs, who entitled his 5th symphony ‘1945’. Also, composer Juris Karlsons gave his music for symphony orchestra the title ‘1945’ (the work itself was composed in 1985). Recognizing the significance of these two compositions in the canon of Latvian symphonic music, as well as the musical and historical links between the works and the composers themselves, the Latvian National Symphony Orchestra, conducted by Andris Poga, recorded these two works, which were then released by the Latvian state record label Skani on the album Ivanovs. Karlsons. 1945 in 2018. The first movement has frequent bursts of sounds, similar to alarms, and the brass instruments provide a dark, pulsating sound to contrast with the shrill strings, while the slow and somber 2nd movement begins as a kind of funeral music, with the flutes and clarinets playing what sounds like a melody of confusion, of something difficult to understand. There is a rise in tension over the course of the movement, and a general ominous sense of unease. The 3rd movement features a section with a solo trumpet, which then leads into an almost sentimental melody, which briefly becomes a waltz, perhaps recalling a time before the war began. The 4th movement then brings the work to a thunderous close with a kind of emotional upheaval that bursts forth, a cataclysmic finale to this emotionally strained opus. According to the extensive and fascinating historical notes by musicologist Orests Silabriedis in the CD booklet, the work initially enjoyed praise and recognition from the Soviet authorities. However, beginning in 1948, there was an extensive reevaluation of music in the Soviet Union and the work was now condemned, and Ivanovs was even forced to repent publically for composing the work, and then, to ‘rehabilitate’ himself, had to compose a more ‘appropriate’ work – his 6th symphony, which was considered as something that could be ‘understood by all’. It was only much later when Ivanovs’ 5th symphony was spoken of positively again. There are many historical details and anecdotes in the booklet, and the text is in both Latvian and English. Juris Karlsons, born in 1948, was a student of Ivanovs, and even completed Ivanovs’ final symphony. 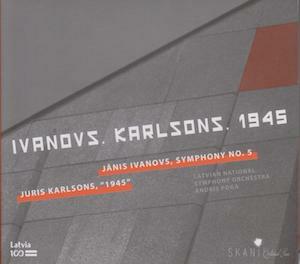 In 1985, to honor the 40th anniversary of the end of the war, Karlsons was asked to compose a work to mark the occasion, and he provided the symphonic work 1945. Further strengthening the link between these two works, the premiere of Karlsons’ work also included a performance of Ivanovs’ 5th symphony. Drawing inspiration from meeting actual survivors of the siege of Leningrad, Karlsons’ 1945 is a similarly fateful and dramatic work. It even begins with the representation of the year in musical form (1st – C, 9th – D flat, 4th – F, and 5th G flat). There are brief moments of lightness and even tenderness in the work, and an accordion makes an appearance in the middle of the work, perhaps to indicate a farewell event for soldiers leaving for war (and perhaps even homage to the similar waltz section of Ivanovs’ work). The work comes to an expansively dramatic conclusion, perhaps to signify the victory of the Soviet forces. The Latvian National Symphony Orchestra, conducted by Andris Poga, has created memorable and evocative performances of these two major works. The deft and precise performance of the orchestra brings out the artistry in both of the symphony works, creating detailed musical imagery that reveals the many sonic facets in these works, from terror and fear to a fragile sense of peace, and even triumph. 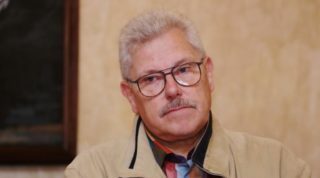 Ivanovs. Karlsons. 1945 is an affecting and moving document of these works inspired by the tragic events of 1945. 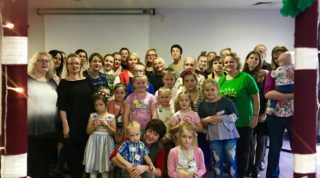 Tarkšķi is a Latvian children’s and youth folklore ensemble with a 25 year history, originally founded in Rīga, but later established in the Iecava district, in the Zemgale region of Latvia. Throughout its history, many of its members go on to further musical projects and groups, such as Tarkšķi members Laura Marta Līcīte and Laura Liepiņa, who went on to join the ethnomusic ensemble Tautumeitas. Tarkšķi have since expanded, and an offshoot group was created, this time with a focus on performances that include the mandolin (and many of them – the songs often have five or more mandolinists performing). 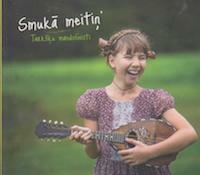 Appropriately entitled Tarkšķu mandolīnisti, the ensemble performs songs from the Zemgale region of the early and mid-20th century, and they released their first album – Smuka meitiņ’ – in 2018. The group’s leader is Kristīne Karele, and she also arranged all of the performances on the album. According to an interview with Karele, the interest in the mandolin was partially due to the mandolin being actively used in ensembles in Iecava throughout the years, even in the early 20th century. Karele went through folklore collections and recordings to gather songs for the group’s repertoire, focusing on songs from Zemgale, and, where possible, from the Iecava region. On the CD, Karele is joined by mandolinists and vocalists Katrīna Karele, Anna Patrīcija Karele, Kristīne Karele, Kristija Laura Čipena, Rebeka Ivanova, as well as guitarist Viktorija Veinberga, and a number of young singers (some as young as nine years old). Beyond the mandolin, the members also add violins, accordions, and percussion to make for a wide instrumental variety. The goal was to gather lively and active songs, and the ensemble succeeded quite admirably in this effort, beginning with the first song on the album ‘Leijerkastnieks’, a song about an organ grinder playing on the street. There are many such moments on the album, such as ‘Ak, meitiņas’, a song about the foolishness of a young girl getting married, since she is likely to spend her life with someone who drinks and argues often. Many songs are about the relationships between girls and boys (particularly girls complaining about boys), such as ‘Meitas puišus apsūdzēja’, where the girls complain about the boys’ behavior to the superintendent in Jelgava, who then threatens to send the boys to Germany unless they change their ways. There are moments of sadness as well, such as in ‘Kārlis un Anna’, where Kārlis must leave his Anna to go off to war, but, when he returns, he finds Anna’s grave. The sound of multiple mandolins at once provides for a unique sonic texture for the group, occasionally sentimental, with a touch of the Mediterranean about it, such as in the instrumental waltz ‘Grievaltas valsis’, with its mandolin harmonies joined by the melody of the violin. A similar effect is achieved on another instrumental number – ‘Poļu kadriļa’ (Polish quadrille or square dance), which features remarkably precise and dexterous mandolin playing. Credit also must be given to album producer Kaspars Bārbals (who has produced many Lauska folk releases), for the crispness and clarity of the performances. Tarkšķu mandolīnisti’s Smuka meitiņ’ is certainly one of the most exuberant and joyful Latvian folk albums in recent memory, and is made even more distinctive and memorable with the sounds of multiple mandolins. With their energetic and buoyant performances, the album makes for a delightful and charming listen. 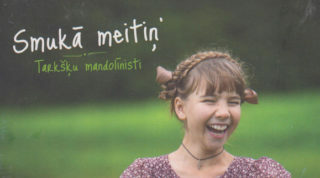 As with many of their releases, the Lauska folk music label has given many Latvian ensembles the opportunity to record and release their music for listeners to hear, and Smuka meitiņ’ is a treat to listen to. For further information, please visit the Tarkšķi Facebook page.